Roman’s (If You Were Me and Lived in…Italy, 2015) newest Captain No Beard adventure takes the stormy high seas to a new level. Captain No Beard and his crew are off on an adventure to Dew Rite Volcano, but there are clouds on the horizon. Although the captain’s crew expresses concern about possible bad weather, he dismisses them, claiming to be the resident expert on clouds. Despite increasingly rough seas, he orders Polly to make chocolate pudding in the galley and baby Zach to raise the flag. The crew becomes more agitated as the weather worsens, but the captain still refuses to acknowledge their points, insisting that it’s his job to make decisions. It isn’t until he has to save Zach from being swept overboard that he finally realizes how dangerous the situation is. At first, he refuses to apologize, using his traditional lament that “Being a captain is hard work,” but his crew reminds him that it isn’t his job to know everything. As a team, they say, they can work together to make good decisions if they trust one another’s knowledge. Hallie wisely points out that he has “two ears and one mouth” because listening is more important than talking. The captain finally apologizes and admits that he doesn’t, in fact, know everything, and his team cheers his wisdom. As in all the Captain No Beard books, Roman weaves a powerful lesson into the adventure, teaching young readers about friendship, humility, asking for help, and forgiveness. It does feel slightly repetitive when the captain continuously disregards his crew’s concerns about the storm, but the raging seas and rising danger keep things moving along. 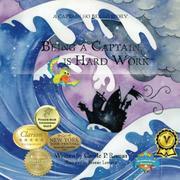 The illustrations are clever and engaging, bringing Captain No Beard and his crew effectively to life. The roiling clouds and stormy seas also provide great images. Roman adds an extra bonus with the captain’s discussion of the different types of clouds, and a glossary at the end of the book provides a good recap for young readers wishing to learn more. A fantastic pirate adventure that mixes life and science lessons with danger, friendship, and triumph.